Cold Spring Harbor Laboratorys long-running Neurobiology of Drosophila course has trained a generation of neuroscientists, many of whom have become leaders in the field. Drosophila Neurobiology: A Laboratory Manual offers the detailed protocols and background material developed by the course instructors to all researchers interested in using Drosophila as an experimental model for investigating the nervous system. 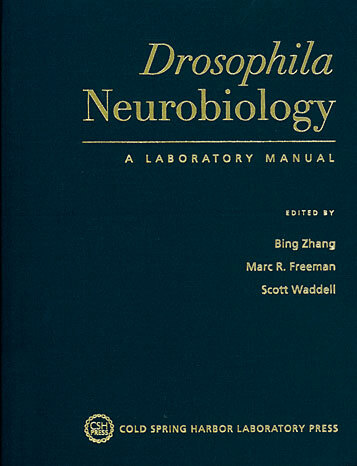 The manual covers three approaches to the field: Studying Neural Development in Drosophila melanogaster, Recording and Imaging in the Drosophila Nervous System, and Studying Behavior in Drosophila. Techniques described include molecular, genetic, electrophysiological, imaging, behavioral and developmental methods. Written by leading experts from the community, Drosophila Neurobiology: A Laboratory Manual is an essential guide for researchers at all levels, from the beginning graduate student through the established primary investigator. Movies are freely available online at www.cshprotocols.org/drosophilaneurobiology. Movie 28.1 One male fly approaches the other and lifts his wings in a threatening pose. This wing threat extends for >10 sec although the movie is clipped before the end. Movie kindly provided by Olga Alekseyenko. Movie 28.2 The male fly on the left lunges three times in quick succession at the male on the right. Lunging is when one male fly rears up on his hind legs and snaps down on the other fly. Movie kindly provided by Olga Alekseyenko. Movie 28.3 This extended encounter starts with the male fly on the left approaching a second male and lunging twice in quick succession. The second male turns and retaliates with lunges that escalate to boxing, tussling, holding, and many lunges. Movie kindly provided by Olga Alekseyenko. Movie 30.1 Introduction of flies into a wheel chamber using a mouth aspirator.